It is called the Health Coverage Tax Credit. It’s like getting your smoking cessation and weight loss hypnosis for free! The IRS currently offers a tax credit for the full cost of my hypnosis smoking cessation program. 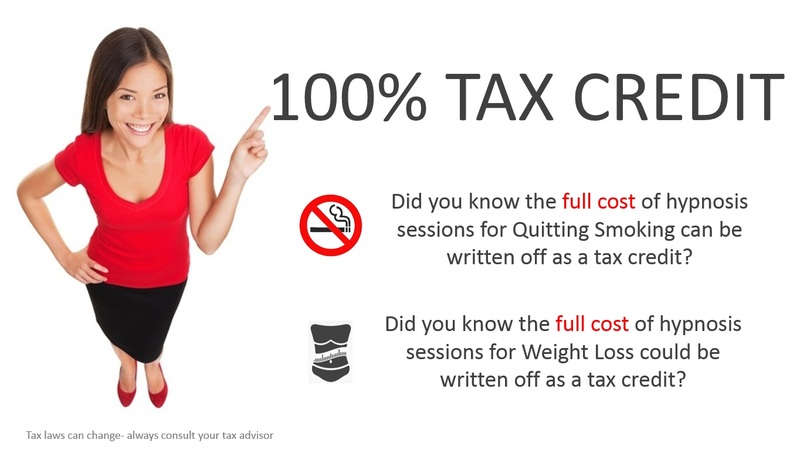 You also qualify for the same 100% tax credit if you see me for weight loss as long as your doctor has decided you need to lose weight. Hypnosis makes change easy and the IRS will pay you back for it! Stop-Smoking Programs | You can include in medical expenses amounts you pay for a program to stop smoking. However, you cannot include in medical expenses amounts you pay for drugs that do not require a prescription, such as nicotine gum or patches that are designed to help stop smoking. Weight-Loss Programs | You can include in medical expenses amounts you pay to lose weight if it is a treatment for a specific disease diagnosed by a physician (such as obesity, hypertension, diabetes or heart disease). This includes fees you pay for membership in a weight reduction group and attendance at periodic meetings. You cannot include membership dues in a gym, health club, or spa as medical expenses, but you can include separate fees charged there for weight loss activities. Need to download your IRS form? CLICK HERE And remember always keep your receipts! *Please note I’m a hypnotherapist not a tax adviser. Tax laws change, so always consult with your tax adviser for the latest rules and regulations.